I’m sure you’ve caught me admitting how tenderfooted I am when it comes to jazz. It’s an intimidating genre that’s had a century of development, with countless artists, musicians, and performers leaving their mark as highly influential individuals. I’m not one to shy away from daunting tasks, so you can often catch me delving into this music mostly in the form of younger contemporaries and fusion artists. It also helps being surrounded by awesome people like the ones that work with me here at Everything Is Noise, who have a deep love for jazz and a penchant for sharing. Which leads me to why we’re here today. I came across Shubh Saran‘s music watching Adam Neely’s YouTube video on subbing as a live bassist in Saran’s band while (accidentally) incredibly high, and it just so happened he was dropping his latest EP, H.A.D.D. What are the odds, huh? I checked it out and was immediately enthralled, looping the project over and over throughout a couple days, coming back to it multiple times since. I even went as far as reviewing it for our Review Rundown feature. The music felt special to me, like something I didn’t hear too often in contemporary jazz music. So, naturally, I thought he would be a great fit as a Weekly Featured Artist! I reached out to Saran, and he was gracious enough to bestow some background to him as a performer, insight into his production process, and more. 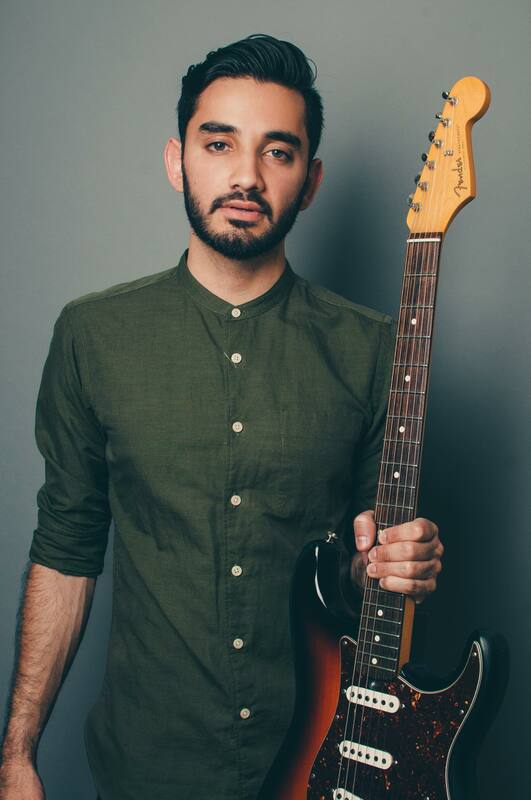 Saran, a guitarist and composer, had a love for music early on as a child. He effectively self-taught himself at a young age how to play songs by looking up tabs and videos online, and conversing with his fellow musician friends with whom he’d trade some tricks and information. He grew up listening to, like so many of us, the pop punk and rock of the new millennium, such as Blink-182, Sum 41, and Green Day, mixing it up with Indian fusion bands like Indian Ocean and Shakti. As his interest in the art of guitar grew exponentially, so did his interest in established greats like John Mayer, Jimi Hendrix, and other blues and rock guitarists. Formal education came into play when he attended Boston’s Berklee College of Music, where he would learn the tenets of jazz, music theory, and production. He was exposed to names like Aaron Parks, Tigran Hamasyan, Django Reinhardt, Gretchen Parlato, Jacob Collier, Kneebody, and Wayne Krantz. After graduating in 2014, he relocated to New York City, where he still resides to this day, picking up more and more knowledge on music and feeling himself out as a musician while playing in the local scene. After all, the best minds out there never truly stop learning. This is just one part of what makes Saran’s music admirable. He surrounds himself with friends and associates, and it shows. You can feel warmth and camaraderie in the soothing, dulcet tones of his work. It’s all in service to a very organic and lively feel that permeates all of his music, all the way up to the release of H.A.D.D. Released on November 9, 2018, this five-track EP was written and constructed by Saran over a period of time, working with ideas he had on guitar. He later would orchestrate those parts for other instruments, create sheet music and demos for others in the band, and incorporate the new compositions into their live set. ‘When it came time to record, we tracked the two drum sets, keys and bass live with scratch guitar, saxophones, and vocals at Studio G in Brooklyn. Then I recorded final guitar, saxophones, and vocals at home, along with all the synth work, production and sampling.‘ He also admits that the biggest struggle in his time producing his music is adding those digital elements, finding that delicate balance between the spontaneity of the live music and calculated finesse of post-production. This has been his process more or less ever since he produced his 2017 debut album, Hmayra. Saran’s intent behind the feel of H.A.D.D. is earnestly felt in its execution. There’s some ethereal qualities to it, but also that warmth I mentioned earlier, giving the music a very human, analog quality; heaven and earth, you might say. “Eudaimonia”, for example, has a guitar tone that moans throughout the track providing one of the primary melodies. The tenor and alto saxophones also have measures that establish a playful, catchy riff that’s light on the ears. The song’s middle has high-spirited piano that continues the playful mood set by the two saxes. Other songs delight in this way, but from slightly different angles. “Sight and Seen” has a more energetic approach, as does “Pareidolia”, “Divisible” has a high piano and guitar focus that’s ballad-like, and “Falter” made me fall in love with its gentle and serene vocals, provided by Hannah Sumner. Hearing such a fully-fledged jazz production got me thinking that surely Saran had other ideas that didn’t necessarily didn’t make it onto H.A.D.D., or even his first album, Hmayra. My curiosity got the best of me, and I had to inquire. ‘Artists have an interesting relationship with their past work because while a part of me is happy with the music I’ve made, another part of me realises how much I’ve changed since my last release and can only focus on what I could have done differently‘,he reflects. He attributes this binary feeling to growing as a musician, stating that his goal now is to be as prolific as he can be. As for what he would like to incorporate in his future music, Saran looks forward to one day recording with fretted instruments like a tenor banjo, mandolin, or bouzouki. He’d also like to make good on his intent to incorporate more classical Indian instruments such as the sarod or dhol. A musician like Saran can’t stay creatively dormant for long. Locally, he and the band will soon start their third month-long residency at Rockwood Music Hall in NYC, beginning on January 21, 2019. He has plans beyond the Big Apple, like another tour through India in 2019, as well as a US tour sometime in the summer. He also told me he has plans to record new music next year, this time with plans to add a few more collaborations with vocalists (fingers crossed for another Hannah Sumner feature!). It goes without saying that Shubh Saran is quite the modern marvel when it comes to jazz. I’d like to extend a huge thanks to him for taking the time to speak with me, as well as for his wonderful music. Be sure to check him out if he’s in your area in the future! Check out our Weekly Featured Artist on Facebook, Instagram, YouTube, and his official website. Listen to his work on Bandcamp, as well as other streaming services like iTunes and Spotify! Previous PostNekromant - "The Nekromant Lives"
Next PostVoices From The Fuselage - "Odyssey: The Founder of Dreams"